​The earliest inhabitants of this beautiful spot on the Delaware River in Hunterdon County New Jersey were the Lenape who called this spot Nishisakawick, which translates as two outlets of a stream near a house. The Lenape hunted and camped here for thousands of years as recent archaeological evidence shows. ​James Alexander, born in Scotland in 1690, and immigrated to America in 1715 and immigrated to America, purchased 10,000 acres in and around Frenchtown NJ. In 1757, William Alexander, his son, and two partners planned out the streets and building lots of our village. It is for this reason that Frenchtown was originally called Alexandria. The final name was give to it by a Swiss whom residents assumed to be French. Our quaint town has undergone a renaissance thanks, in part to tourism, and proudly shows off its wonderful 19th Century architecture, unusual shops, fine ethnic restaurants and spectacular views four seasons of the year. 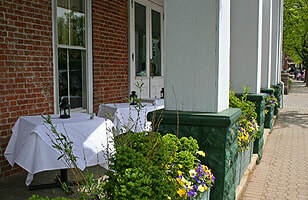 Check out the Frenchtown Inn or any of its small boutique eateries when you visit one of Frenchtown’s exciting events. ​We host three big festivals a year: the Wine and Art Weekend typically in June; Bastille Weekend in mid-July and River Fest in late August which features an independent film festival and an array of green initiatives. ​Some new development projects are making Frenchtown an even more exciting place to be…the new River Mills project by George Michael will feature important new condominiums near the river with store fronts near the bridge; a new riverside park is in the planning stages, and a new Victorian mixed-use building site is under review for the eastern edge of town. Visiting us is just the start. If you are seeking a great community to live in, give us a look. Frenchtown, NJ has very good schools, active churches, committed local organizations and beautiful old homes.